Eagleview Resort is an ideal Weekend Getaways NSW destination, just over 2 hours drive north from Sydney and 45 minutes drive from Newcastle. Eagleview represents a group of owners in Eaglereach Highland Park that are offering their lodges for holiday lettings. These lodges are part of Eaglereach Highland Park a 1000 acre mountain top bushland retreat, just 10 mins from the township of Vacy..
Our lodges offer guests the highest quality four star accommodation. 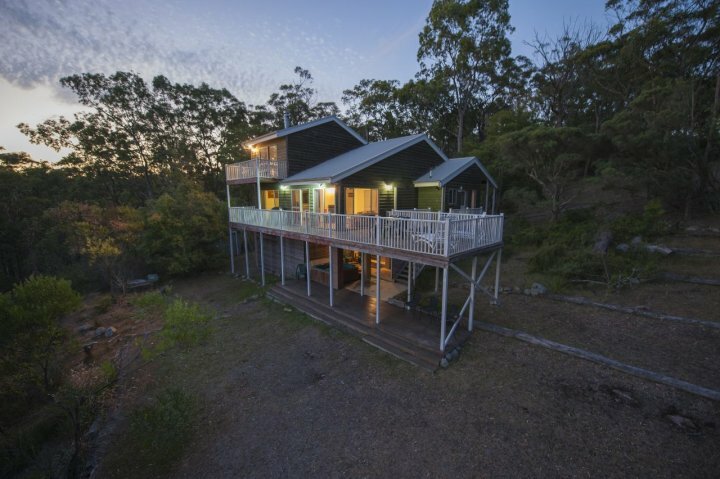 The eco themed lodges range from 2 to 4 bedrooms - in either secluded bush settings that offer complete privacy - or escarpment locations with their breathtaking views over the Barrington Tops and surrounding mountain ranges. The lodges are tastefully furnished with well appointed kitchens and BBQ facilities. All linen, towels, guest consumables such as shampoos and soaps are provided including tea, coffee, sugar,cooking oils, paper towels etc. This is a tastefully furnished and fully equipped 3 bedroom holiday home on 3 levels with a 4 person hot outside spa and sauna. Set in 2 acres it offers excellent views out to the Maitland The lodge is a 5 minute stroll from the resort facilities. Sparkling white wine, tea, coffee, condiments, linen, bedding, toiletries and towels are all included. Dreamtime is a homely 2 bedroom cottage with an open space lounge dining and kitchen area, which provides a comfortable living space. The living area has a slow combustion wood fired heater that provides snug warmth in winter and an airconditioner for summer cooling. There is a hot external spa and spa bath in the main bathroom. 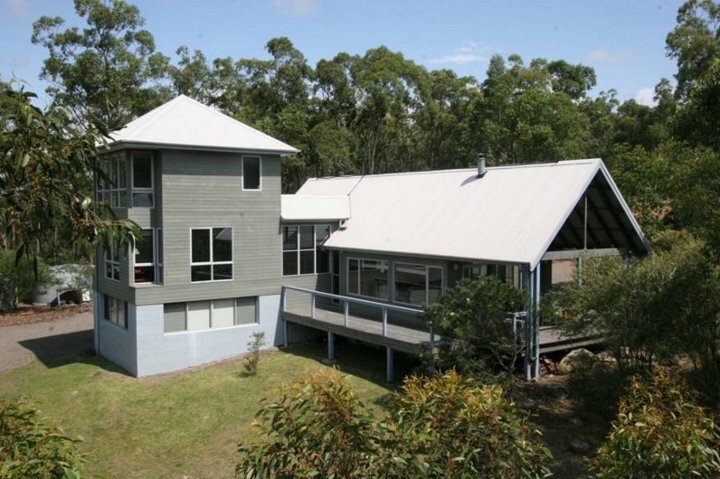 Two storey lodge with downstairs living and bedrooms located upstairs. The lodge provides good open plan living with a modern well appointed kitchen which leads into an open plan dining/living area which leads onto a wide covered veranda with BBQ and spa. There is a slow combustion wood heater and reverse cycle air conditioning. The large bathroom/ laundry downstairs has a clothes dryer and washing machine. Upstairs are three bedrooms and the second bathroom. The main bedroom has a queen bed. The second bedroom has two king single beds which can be joined into a king-sized bed. Bedroom three has a set of double bunks. 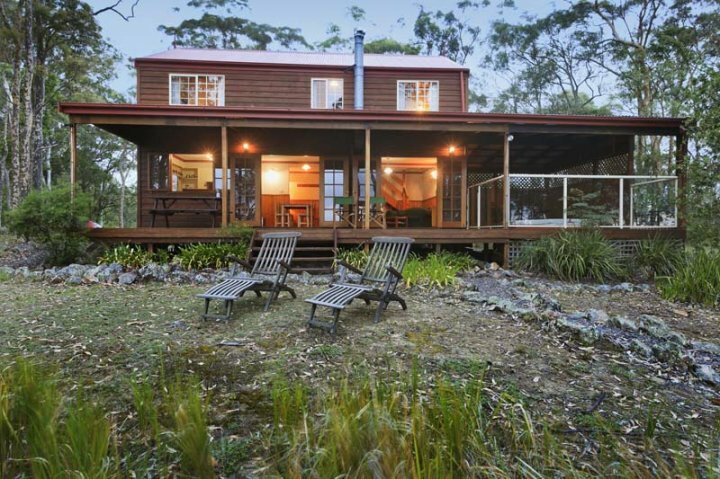 The Lodge offers excellent panoramic views across the Paterson Valley to Barrington Tops. Kangaroos, wallabies, king parrots and other native wildlife roam freely around the lodge which also has a heated 4 person spa located on the outside.Easy chairs are included on the veranda and a gas BBQ is included for outside cooking. The Retreat is a comprehensively and tastefully equipped 3 bedroom lodge which sleeps 6 persons. The Lodge has its own billiard and table tennis tables, push bikes, kayaks, cubby house, BBQ and garage. The lodge is ideal for couples, a group or family (with extra folding beds for kids). Situated on 11 acres of secluded private bush land this lodge is a must for visitors who want to escape and enjoy wildlife. The Retreat Bushland Lodge is situated on 10 acres of secluded bush which is inhabited by kangaroos, wallabies and goannas which roam freely throughout the Resort. The retreat has 2 bedrooms, a billiard room with a single bed in it and 2 roll away beds suitable for children. The bedroom are located upstairs.It has 3 bathrooms, the main bedroom is an en-suite and the second bathroom a 2 person spa bath.. The open plan living, dining and fully equipped kitchen provide spacious downstairs living accommodation. The lodge is equipped with fans throughout. The outside verandah is a perfect outdoors area for relaxation and for watching the passing wildlife. The Lodge provides total seclusion from adjoining properties. This is a comfortable two bedroom stand alone fully furnished lodge with a loft area that is ideally suited for children. The lodge is located within easy walking distance of the Central Resort Facilities. The living room is large and sunny with a comfortable lounge and large flat screen TV and wood fired heater. It has a fully equipped kitchen and separate dining area. The master bedroom has its own en-suite with a Queen bed and the second bedroom has its own bathroom and separate toilet and two singles that can be made up as a king bed. The loft area has a single bed, a lounge chair and a trundle bed. There is a land line pay phone in the Games Room in the Central Resort Facilities. There are no land lines in most of the lodges . However there is good mobile coverage with a Telstra mobile tower located in the Resort.The reception for Optus and Vodafone mobiles is very patchy. Normal check in time is 1.00pm on date of arrival and 10.00am on the date of departure. Earlier check in times and later departure times are offered subject to guest departures and arrivals on the particular days involved. Guests are notified of these changes prior to the arrival date or at the time of final payment. All tariffs are quoted on a 2 person per night basis. Extra adults and children over 13 years of age pay the same daily rate which is $60 per person and $70 per person in holiday periods. Children under 2 years of age are free and those between 2 and 13 years of age $40 per night. On site parking is available in each of the lodges. 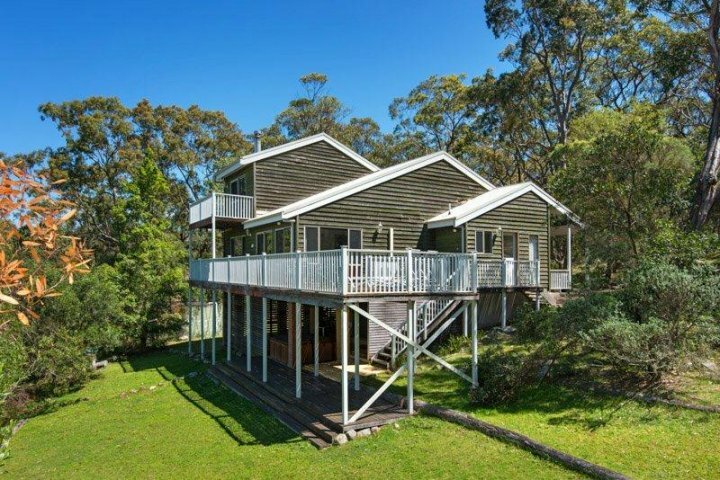 Eagleview Resort is just over 2 hours drive north of Sydney, once you enter the M1 Motorway (F3 Freeway) at Wahroonga.in Sydney. 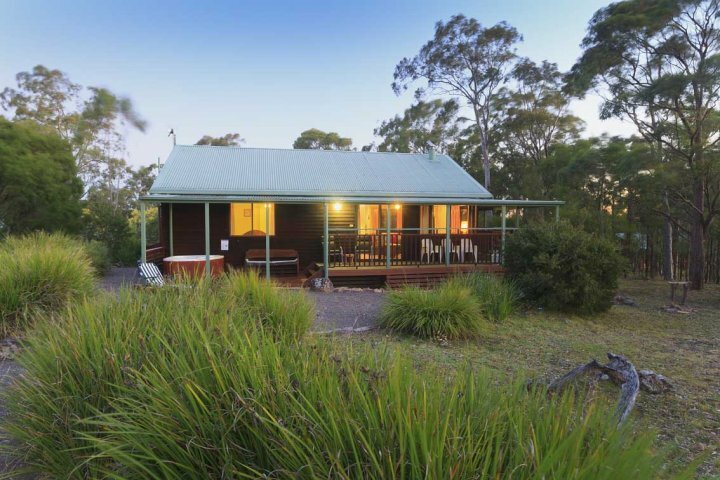 Eagleview Resort is approximately 25 kilometers from the New England Highway at Maitland. Proceed along the M1 Motorway from Hornsby/Wahroonga until you reach the New England turn off to Maitland. Follow the highway to East Maitland and turn right into Melbourne Street,, the main street in East Maitland at the set of traffic lights. Turn off at Pitnacree Road, first on left once you enter Melbourne Street. Proceed along Pitnacree Road until you reach a roundabout. Turn right and follow the signs to Tocal and Paterson passing Tocal College. Once through Paterson proceed on to Vacy and through the one lane bridge. Then turn left into Summer Hill Road, following the sign to Eaglereach. Turn left into Moonabung Road at the large Eaglereach sign and follow it up to the top of the mountain passing through the farm gate type entry. Once at the top turn left into Cooee Trail and follow the map showing the location of particular lodge. All lodges offer TV, DVD and music facilities. Of course here at Eagleview, we know you may want to do absolutely nothing save choosing the wine for dinner, or waiting for your next massage ( you can book one in your room!). On the other hand, you may wish to do absolutely everything, and as the ultimate Holiday Home Rental facility, you have a wide selection of activities from which to choose. For those seeking adventure, the resort has two walking trails, one winds through the rainforest and the other more challenging trail winds along the escarpment. Both trails require a modest degree of fitness - but we guarantee it is worth the walk, and that you will run into our friendly kangaroos,wallabies, king parrots, crimson rosellas and the occasional echidna or wombat. A new easy walk has also been established which runs around Goonarook Lagoon. If you're looking for other ways to burn up some energy, try out our exercise facilities, children's playground, table tennis, tennis court, yabby lagoon or Goonarook Lagoon. Or why not go swimming in the pool, trail bike riding (bikes not supplied) 4WD driving or just enjoy the lazy, hazy days of summer with a picnic basket. All these options are available to you when you book one of our splendid holiday homes for rent. For something further afield, Goonarook Lagoon provides fresh water swimming, kayaking ( kayaks not supplied) along with BBQ picnic facilities. For foodies, there are half a dozen dining options nearby offering good value including the Flying Duck Cafe, The Farmers Rest Hotel, The Beatty Hotel, Yabbies Restaurant and of course the Resort's own Bistro Restaurant.